To Cite: Khaleghian M, Jahanzad I, Shakoori A, Emami Razavi A, Azimi C. Association Between Amplification and Expression of C-MYC Gene and Clinicopathological Characteristics of Stomach Cancer, Iran Red Crescent Med J. 2016 ; 18(2):e21221. doi: 10.5812/ircmj.21221. Background: The incidence rate of gastric cancer in western countries has shown a remarkable decline in the recent years while it is still the most common cancer among males in Iran. The proto-oncogene MYC, located at 8q24.1, regulates almost 15% of human genes and is activated in 20% of all tumors. The amplification of MYC and overexpression of its protein product are observed in 15 - 30% of gastric neoplasias. Objectives: The objective of this study was to find the preferences of Chromogenic In Situ Hybridization (CISH) and Immunohistochemistry (IHC) in diagnosis and prognosis of gastric cancer. Patients and Methods: We studied 102 samples of gastric cancer in Iran and all the patients had undergone primary surgical resection at the Cancer Institute Hospital, Tehran University of Medical Sciences. The CISH and IHC techniques were applied for all our samples. All of the samples had adenocarcinoma gastric cancer and were selected randomly. Also, the type of study was cross sectional. The sample size was 100 patients. Results: Our data revealed that both diffuse and intestinal types of gastric cancer occurred significantly more in males than females. Our results showed that there was an indication of some correlation between grades and CISH, although the difference was not significant. Our data also showed that CISH positive patients (43%) were more frequent compared to IHC positive patients (14.7%). There was a correlation between CISH and IHC. These results revealed that there was a significant difference between grades and IHC. There was also no statistical difference between CISH amplification in diffuse and intestinal types. Conclusions: From the results, it could be concluded that for administration of the treatment of stomach cancer, and progress and prognosis of tumor, which is important for patients and clinicians, the CISH is a better and more feasible test than IHC, in regards to sensitivity and specificity. Cancer is a leading cause of death worldwide and accounts for 7.6 million deaths every year. The first and second most common causes of cancer death in the world are lung cancer (1.37 million deaths, annually) and gastric cancer (736000 deaths, annually), respectively (1). About 70% of all cancer deaths have occurred in low- and middle-income countries. Gastric cancer is the fourth most common cancer in males, while in females it is the fifth most common cancer (based on statistics published in 2008) (2). The incidence rate of gastric cancer in western countries has shown a remarkable decline in the recent years while it is still the most common cancer among males in Iran. Based on Age-Standardized Incidence Rates (ASR) the most common cancer in males was stomach (10.2), while in females, stomach cancer (5.1) was the third most common cancer (3). Although the incidence of stomach cancer is decreasing, it is still a major health problem and a major cause of cancer death around the world (4). It has been suggested that carcinogenesis of stomach cancer is due to a collection of genetic alterations of many genes such as oncogenes, tumor suppressor, and mismatch repair genes (5). It has been suggested that there are many genes that raise the risk of stomach cancer, because some genes such as MCC, APC, and P53 tumor suppressor genes have been found in a numerous cases of gastric cancers (6). Cadherin-1, also known as CAM 120/80 or epithelial cadherin (E-cadherin), is a protein that in humans is encoded by the CDH1 gene, which is a tumor suppressor gene (7). Many researchers have reported E-cadherin, a calcium-dependent adhesion molecule that is responsible for cellular binding to adjacent cells, as an important part in the etiology of stomach carcinogenesis (8). Genetic predisposition implicates transmission of a single mutated CDH1 allele. If a second similar allele has been in the E-cadherin gene, then lack of intracellular adhesion causes an increase in intracellular permeability (9). A broad range of mutations has been found in gastric cancers (10). The frequency of stomach cancer is higher among senile populations, manifesting more at about 70 to 80 years of age. In a study with a large sample, the mean age of diagnosis was 67 years old (11). Worse clinicopathologic characteristics and prognosis for gastric cancer has been suggested among young patients (12). The proto-oncogene MYC, located at 8q24.1, encodes a nuclear phosphoprotein, regulates almost 15% of human genes and is activated in 20% of all tumors (13). Activation of unsuitable MYC gene, which contributes to the development of human tumors, is functioned through different mechanisms: chromosome translocations, which has already been shown in Burkitt lymphoma; juxtaposition of the promoter region of the immunoglobulin heavy chain gene, which is highly expressed in B cells, because it is next to the MYC gene; excitation of gene transcription, as has been documented in colon cancer cells; retrovirus insertion next to the MYC locus, where through the retroviral regulatory sequences, the MYC expression would be activated, and gene amplification and the copy number of MYC gene would be excessed, and as a result its expression would be increased between other cells (14). Hence, any changes in MYC oncogene are usually persuaded by phenomena such as gene amplification, chromosome translocation, point mutations, viral insertion at the MYC locus, and resistance of MYC protein to ubiquitin-mediated proteolysis and raised translation or transcription by signaling other oncogenic pathways (15). The location of the MYC protein is in the nucleus, and acts as a growth promoter and a transcription factor. Transcription factors of bHLH are a big family, which contain MYC, and form homo and heterodimers with themselves and with other family members. These dimeric complexes are related to regulatory sequences called E-boxes (with CACGTG sequence), detected in promoters of target genes, which they regulate (16). One of the necessary ligands for most of biological functions is the MAX protein, which is used by MYC. When MAX and MYC proteins dimerize, they will act to activate transcription. Although it seems that the MYC protein is expressed independently, yet in fact, the MYC protein of each cell is complexed with the MAX protein (17). Usually, the levels of MAX are stable within cells, yet the MYC levels are strongly affected by mitogenic signals. In this regard, when normal cells are grown without mitogenic components, the level of MYC will fall, while, MYC accumulates significantly in the presence of serum mitogens. This indicates that the levels of MYC-MAX heterodimer are constantly regulated by the current of mitogenic signals, which normal cells receive (16). The MYC gene has three exons, and its protein products (p64 and p67) include strongly conserved nuclear phosphoproteins, with high amounts of p64 compared with p67, called MYC-2 and MYC-1, respectively (18). It has been suggested that patients with late stages of gastric cancers or with metastases, show higher levels of MYC amplification, and on the contrary, patients at the early stages show lower amplification (19). The amplification of MYC and overexpression of its protein are found in 15 to 30% of gastric cancers (20). Some authors have suggested that MYC overexpression is more frequent than MYC gene amplification in stomach adenocarcinoma (21). In more than 40% of cases with stomach cancer, overexpression of MYC has been reported (22). Some researchers have reported on the association between metastasis and higher level of MYC expression (22). Another report showed that MYC mRNA levels were also higher in patients with metastasis than in cases with primary lesions (23). Yang et al. pointed out that in advanced stomach cancers, MYC expression was higher than in early stages (24). On the contrary, Onoda et al. suggested that MYC expression was more frequent in early than in advanced lesions, yet other studies have not proved this difference (23). Tsuboi et al. (19) noticed that MYC protein expression elevated gradually as the lesion progressed, such as that found in chronic active gastritis, gastric ulcer, mild non-classic proliferation, severe non-classic proliferation, and early and advanced stomach cancer (19) These findings proved that MYC amplification could be a serious phenomenon of gastric carcinogenesis. The objective of this study was to find the preferences of CISH and IHC in diagnosis and prognosis of gastric cancer among 102 patients with adenocarcinoma. Considering that Z = 1.96, P = 40% and accuracy was 10%, 92 samples were sufficient for this study. To ensure a 10% increase, 100 samples were studied. Patients and tissue samples: sample size for this study was calculated. Patients’ approval was retained according to local authorities by the Ethics Committee, Tumor Bank, Cancer Institute of Iran. Written informed consent was obtained from all participants and the Institutional Ethics Committee approved the study. Gastric cancer samples were classified according to Lauren (25). The patients were staged using a standard method by Tumor-Nodes-Metastasis (TNM) staging (26). Chromogenic in Situ Hybridization (CISH) was carried out on 3-µm-thick formalin-fixed paraffin-embedded tissue sections. The 3-µm-thick sections were cut from paraffin blocks and dewaxed with xylene, and then rehydrated with a series of 70% to 100% ethanol and water. Target retrieval and enzyme digestion were achieved using a commercially available tissue pretreatment kit (no.C-3018-40; from ZytoDot Germany). All denaturation and hybridization kits were made in China. On the first day, slides were incubated in pretreatment buffer, in a water bath (mmert-Germany) to at least 85°C for 30 minutes, with a ZytoDot CISH Implementation Kit (Germany). Next, pepsin solution was applied to the tissue followed by incubation for eight minutes at room temperature in a humidity chamber. The sections were dehydrated in upgrading ethanol series and air-dried. Ten microliters of zytoDot CISH probe C-MYC were applied to the slides, and the slides were enclosed by a coverslip (22 x 22mm) and denatured on a hot plate for five minutes at 94 - 95 °C. The slides were then transferred to a humidity chamber and hybridized overnight at 37°C. On the second day, the coverslip was removed by soaking in Standard Saline Citrate (SSC) solution at room temperature for five to ten minutes and washed in SSC buffer for five minutes at 75°C. The slides were incubated in 3% H2O2 for 10 minutes. Blocking solution was also applied to the slides. Next, a hybridized probe linked to digoxigenin was detected by mouse anti-digoxigenin antibody followed by polymerized horseradish peroxidase antimouse immunoglobulin. Peroxidase was developed with diaminobenzidine, and nuclei were counterstained with hematoxylin. All detection reagents were provided by commercially available kits. The interpretation of CISH results was performed by the first author (M.Kh) with a light microscope using a 40 × objective (original magnification, 100 ×; Figure 1 A - D). Signals were seen as nuclear dark brown dots. Fifty to 100 non-overlapping tumor cell nuclei were evaluated per sample. A gene copy number of one to two copies per nucleus were scored as “no amplification” (Figure 1A). A gene copy number of two to four copies per nucleus in at least 50% of cancer cells were considered as “low-level amplification” (Figure 1B). A gene copy number of four to six copies per nucleus in at least 50% of cancer cells were considered as “moderate level amplification” (Figure 1C). A gene copy number of more than six copies per nucleus or the presence of clusters in at least 50% of cancer cells was considered as “high-level amplification” (Figure 1D) (18, 19, 27). Non-neoplastic cells in tissues were always considered as in-test quality controls. Chromogenic in situ hybridization were evaluated with Leitz microscope images and were captured with a digital Nikon camera. All the slides of patients were confirmed for diagnosis and were checked for CISH and IHC by one senior pathologist (I.J). A, No amplification; B, Low amplification (2 - 4 signals); C, Moderate amplification (4 - 6 signals); D, High amplification (more than six signals, which looked as large copy gene clusters in the majority of the nuclei of gastric cancer cells) (original magnification, 500 ×). Immunohistochemical staining was performed according to Calcagno et al. (28). The 3-µm-thick sections were cut and deparaffinized. Slides were incubated in hydrogen peroxide, and antigen retrieval was carried out by heat treatment in 0.294% wt/vol citrate buffer at pH 6.0 in a domestic microwave oven (botan-Iran) as follows: 900 W for five minutes and then 600 W for 10 minutes, excluding slides that were dried out. Tissues were incubated in digestive enzyme (pepsin enzyme), for five minutes. Super Block was then applied. Immunohistochemical staining was performed using the Horse-Radish Peroxidase (HRP) method with a monoclonal antibody (monoclonal rabbit, Ready to use, PME 415 AA Biocare Medical, USA), as recommended by the manufacturer. A universal peroxidase-conjugated secondary antibody kit (AmpliStain Anti-Mouse/Rabbit 1-Step HRP, Germany) was used for the detection system (SDT, Germany). The slides were visualized with diamino-benzidine-H2O2 (DAB) and counterstained with hematoxylin (SDT). Any nuclear stain with or without cytoplasmic staining was considered as positive results, irrespective of intensity (Figure 2). A MYC-positive case was defined as one having 10% or more tumor cells positive for this protein. 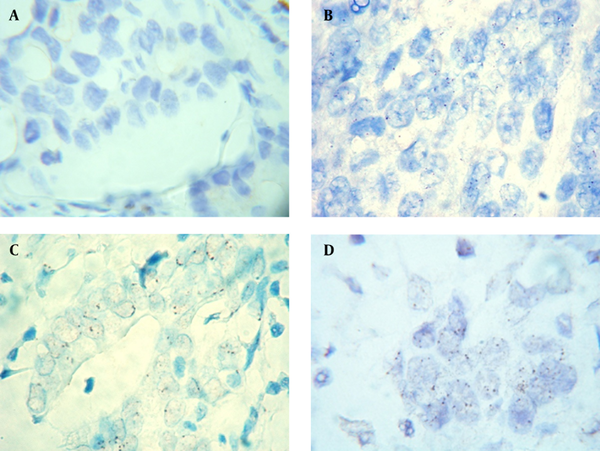 A, Negative IHC in gastric adenocarcinoma; B, Positive IHC in gastric adenocarcinoma. The statistical calculation was carried out using version 18 of the SPSS software for Windows. In order to assess the degree of agreement between CISH and IHC test, Kappa statistics was applied. The variables of patients according to the two types of diffuse and intestinal gastric cancers were analyzed using the chi-square test. The variables of patients according to C-MYC amplification (CISH) and C-MYC expression (IHC) with two groups were tested with the Mann-Whitney test, and variables with more than two groups were tested with Kruskal-Wallis. For determining the association between CISH and IHC, Kappa test and the Spearman correlation coefficient were used. Commentary of the Kappa test was as follows: poor agreement (less than 0.20), fair agreement (0.20 to 0.40), moderate agreement (0.40 to 0.60), good agreement (0.60 to 0.80), and very good agreement (0.80 to 1.00) (29). P values of less than 0.05 were considered as significant in all tests. This investigation included 102 patients from Iran with gastric adenocarcinomas. In our samples, 78 patients were males and 24 cases were females, and the average age was 60.62 years old. The amplification of MYC and its protein expression (CISH and IHC tests) were carried out and analyzed for all patients. The clinicopathological features are shown in Table 1. The location of the tumor was the fundus in 35.3% of patients, while the location was the cardia in only 3%. Types of gastric cancers were diffuse (56.9%) or intestinal (43.1%). The average tumor size of patients was 6.49 cm. Table 1 shows that some of the variables including gender, location of tumor, necrosis, vascular invasion, perineural invasion, CISH, and IHC had significant differences amongst the diffuse type, while gender, location of tumor, vascular invasion, necrosis, CISH, and IHC had significant differences amongst the intestinal type. This means that subgroups of each variable are different in the two types of gastric cancer. These results also showed that there was no relationship between age, grade and stage, and type of stomach cancer. Our data revealed that both diffuse and intestinal types of gastric cancer occurred significantly more in males than females (Table 1). The majority of our patients (69.6%) were in grades II and III, which was the same as the stages, with 59.8% in stages II and III (Table 1). The results of CISH and IHC are shown in Table 1. This study revealed that there was no association between age, gender, tumor location, necrosis, vascular invasion, perineural invasion, stages and type of gastric cancer, and the CISH test. Our data showed that there was an indication of some correlation between grades and CISH, although the difference was not significant. Our data also showed that CISH+ patients (43.1%) were more frequent compared to IHC+ patients (14.7%). Table 3 shows the correlation between CISH and IHC. Different amplifications by the CISH test are shown in Table 2. According to our CISH data, 58 samples showed no amplification and among 44 samples with CISH+, 24 samples showed low amplification. Six samples showed moderate amplification and 14 samples showed high amplification. We also considered low amplification as CISH+ (Table 3). aKappa: value agreement = 0.284, percentage of agreement = 28.4%, P value = 0.0001, statistically significant difference from zero. bThe values are presented as No. (%). Table 2 shows the comparison of CISH and IHC. This result revealed that there was a significant difference between grades and IHC. Table 3 shows the results of IHC positive and negative patients. Immunoreactivity of MYC was seen in 15 patients. In 13 patients both MYC amplification and MYC immunoreactivity were observed. Fifty-six samples had no amplification and were IHC negative. Also among 44 positive samples for CISH, 13 samples had positive signals for IHC and 31 samples had negative signals for IHC. Most of the IHC negative patients had no amplification yet only two IHC positive patients had no amplification. Normal cells also had IHC negative results (Table 3). Our patients were divided to four groups. The first group was both CISH+ and IHC+ (12.7%). The second was CISH+ and IHC- (30.3%). The third group was CISH- and IHC+ (2%). The fourth group was CISH- and IHC- (55%). Amongst our four groups, the kappa test result was 0.284, which indicated fair agreement between CISH and IHC (Table 3). To determine the association between CISH and IHC testing, the Spearman correlation coefficient was applied. The correlation coefficient was -0.365 with a p value of 0.0001, indicating that these two tests were related. In this investigation 43% of the samples were positive for CISH, yet only 14.7% were positive for IHC. In the present investigation, 102 patients with stomach cancer were assessed. Our cases included of 78 males and 24 females, with a male: female ratio of nearly 3:1, and an average age of 60, 62. Our data were in agreement with another research, which gave a ratio of 2:1 and the majority of the patients were older than fifty-five (30). Another study from Iran was also in agreement with our results and mentioned that gastric cancer was the most common cancer in Iranian males (31). In this study, the tumor location was divided into seven subgroups and the majority of our patients had a tumor in the fundus location. If we divided our patients into two groups of cardia and non-cardia, we would have only 3% cardia and 97% non-cardia. One research studied gastric cancer among 125 samples, with only two subgroups of cardia and non-cardia, and found that 58.4% of the samples were in the non-cardia subgroup, which is in agreement with our results (30). The majority (59.9%) of our patients had the diffuse type, yet some authors reported intestinal type more than the diffuse type (30-32). The best explanation for this difference is that their samples were from Brazil and Japan, both being high-risk areas, yet our data was from Tehran, which is considered a low-risk area. It has been already documented that intestinal type of gastric adenocarcinoma was more frequent than the diffuse type in high-risk countries (33). Some authors have reported an association between overexpression of C-MYC and over 50% of cancers in humans, and also the effect of this overexpression on invasiveness and worse prognosis in patients. Contribution of MYC to tumorigenesis by persuading reinless cellular growth, angiogenesis, proliferation, and genomic instability has been already documented (34). It was suggested that the C-MYC constitutive expression owing to amplification, mutation, or chromosome translocation involves the development and progression of various cancers (35). C-MYC persuades point mutations, imperfect replication initiation, DNA breakage, changes of DNA repair, and causes remodeling of the 3D nuclear structure of telomeres and chromosomes, thus leading to topological positions that initiate genomic instability (36). Most of the patients in different studies were at the early stage of gastric cancer and from high-risk areas, such as Japan and Korea. However, another author showed higher MYC amplification in the diffuse-type, than the intestinal-type, which agreed with our results (28). One study of IHC analysis revealed that MYC expression was more frequent in the intestinal-type than the diffuse-type (37). On the contrary, we observed more frequent MYC expression in the diffuse type. Association of MYC over-expression with the proliferative phases of cells has been documented and this expression was shown only in proliferative phases of development, but not in quiescent or terminally differentiated cells (38). Our results revealed that there was a significant difference between grades and IHC. We showed an increase in MYC expression, especially in grades II and III. This result is similar to the findings of previous results, which revealed that MYC expression is down regulated with cell differentiation, and also another investigation, which showed the MYC expression was repressed in grade I gastric cancers, whereas there was a significant increase of MYC protein expression in grades II and III (38). In our investigation there was no significant difference between IHC and stage. However, some studies have shown high levels of MYC protein expression at early stages (39). There was no significant difference in the percentage of cells with C-MYC gene amplification between early (pT1) and advanced (pT2-4) stomach cancers (39). This study was in agreement with our investigation. It was suggested that there was no association between C-MYC gene amplification and differentiated/undifferentiated carcinomas (39). However, our data showed that there was an indication of some correlation between CISH and grades, although the difference was not significant. Among our samples 12.7% had both positive CISH and IHC. Although we observed C-MYC amplification (CISH-) and IHC+ in only two patients, it seems that this may have been an artifact. Overall, 30.3% of our patients showed C-MYC amplification (CISH+), yet the protein was not expressed (IHC-) (Table 3). The possible explanation would be that a mechanism might have degraded the protein or the mRNA (45). Our data showed a correlation between CISH and IHC, and the percentage of positive CISH and IHC were 43% and 14.7%, respectively. Therefore, it might be concluded that CISH is a better test than IHC. Some authors discussed on the molecular therapeutic targeting of MYC and showed that MYC inactivation suppresses tumors in animals (37). In other words, specific knockdown of C-MYC may decrease the growth and proliferation of gastric cancer cells, therefore, C-MYC could be a possible target in gene therapy (46). Dr. Cyrus Azimi and Ms. Malihea Khaleghian would like to thank the Cancer Research Center, Tehran University of Medical Sciences, for their kind financial support (Grant number: 90-01-51-13605). This manuscript was extracted from Ms Khaleghian’s Ph.D. thesis submitted to the Tehran University of Medical Sciences. Authors’ Contribution: Malihea Khaleghian and Issa Jahanzad have equal contributions to this work. Study concept and design: Abbas Shakoori, Malihea Khaleghian, and Cyrus Azimi; acqisition of data: Malihea Khaleghian and Issa Jahanzad; analysis and interpretation of data: Issa Jahanzad and Malihea Khaleghian; drafting of the manuscript: Cyrus Azimi and Malihea Khaleghian; critical revision of the manuscript for important intellectual content: Cyrus Azimi and Malihea Khaleghian; statistical analysis: Amirnader Emami Razavi and Maryam Mohammadi; administrative, technical, and material support: Malihea Khaleghian, Issa Jahanzad, and Abbas Shakoori; study supervision: Cyrus Azimi. Funding/Support: This study was carried out mainly by personal funds, and partially funded and supported by a grant awarded to Dr. Cyrus Azimi and supported by a grant awarded to Dr. Cyrus Azimi and Ms. Malihea Khaleghian from the Cancer Research Center, Tehran University of Medical Sciences, (Grant number: 90-01-51-13605), for Ms. Khaleghian’s Ph.D. project.